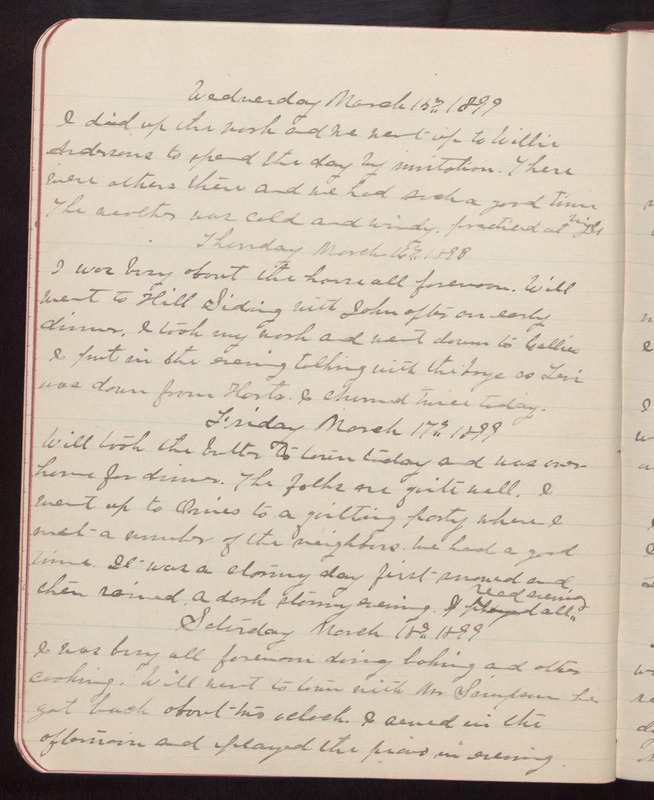 Wednesday March 15th 1899 I did up the work and we went up to Willie Andersons to spend the day by invitation. There were others there and we had such a good time The weather was cold and windy. practiced at night Thursday March 16th 1899 I was busy about the house all forenoon. Will went to Hill Siding with John after an early dinner. I took my work and went down to Callies I put in the evening talking with the boys as Levi was down from Harts. I churned twice today. Friday March 17th 1899 Will took the butter to town today and was over home for dinner. The folks are quite well. I went up to [Ossies] to a quilting party where I met a number of the neighbors. We had a good time. It was a stormy day first snowed and then rained. A dark stormy evening. I read all evening Saturday March 18th 1899 I was busy all forenoon doing baking and other cooking. Will went to town with Mr Simpson he got back about two oclock. I sewed in the afternoon and played the piano in evening.